Ask Clarence Willie Griffith of Dallas, Texas how old he is, and you might be in for a surprise. He jokes that he is 93 years old and holding. He’ll even whip out his driver’s license to prove he’s telling the truth--making sure to note that he’ll be 94 in March. His age doesn’t stop him from traveling and working on a variety of in state and international mission trips. 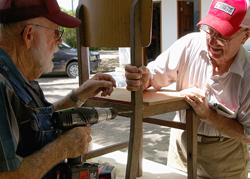 In fact, this trip to Maceio marks Griffith’s 42 international mission trip since the mid-1980s. His first trip in 1985 took him to the island of Barbados. Six months later, after the International Missions Board for the Baptist Church “got his name in the computer” Griffith was asked to travel to the Philippines. 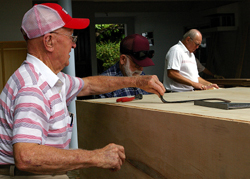 “I fell in love with volunteer missions,” Griffith said. “This is what I do. Griffith said even before he became involved with volunteer mission trips, he knew he wanted to give something back to the Lord.--An idea which began to form in his mind as a teenager. In 1929, his family moved to Dallas, Texas. As a ninth grader, Griffith spent a summer working as an electrician’s helper--working 10 hours a day, six days a week for $9 or roughly .15 cents per hour. By today’s standards, Griffith’s pay was terrible, but during the depression it helped him support his parents and siblings. “I was born to a very religious mother and dad,” Griffith said. “They taught us to love the Lord. With that in mind, Griffith began to lay a foundation for his life. After serving in both the World War II and Korean Wars as a master electrician, he returned to Texas and purchased Anchor Electric Company. He later renamed the business Griffith Electrical Service and operated it until 1980. In the last calendar year, Griffith traveled to Russia, Romania and twice to Brazil. This recent trip marks his 15th visit to Brazil. “This is a beautiful country and these are beautiful people,” he said. Griffith’s travels have served as a model for his son, three grandchildren and two great-grandchildren. His son, David, went to Russia last year on his first mission trip. “He told me, ‘now I see why you are so happy when you are planning a mission trip or on a mission trip,’” Griffith said. Griffith said he plans to continue to travel “until the good Lord takes me home.” He maintains an active lifestyle, watches what he eats and follows his doctor’s advice. 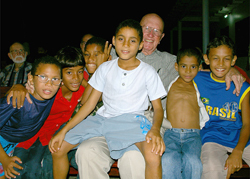 Clarence Griffith with some of the boys he helps during his stay in Maceio Brazil. Kaylea Hutson | JoplinDaily.com. 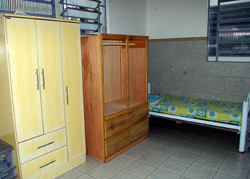 Clarence Griffith working on a clothes closet during his stay at the boy's orphanage in Maceio. Kaylea Hutson | JoplinDaily.com.